Water Heater Repair Marysville WA Can Depend On! Any Tank Size, plus Tankless Water Heaters! When you call Plumbing Experts NW, you get decades of experience of service to water heater repairs in Marysville WA and surrounding areas. Experience makes all the difference when approaching a leaky hot water heater, and trying to discern if there's something loose or malfunctioning, OR if the tank is rusted-out and needs to be replaced. One thing is for sure, most families in the Marysville area won't be able to go without running hot water for long. 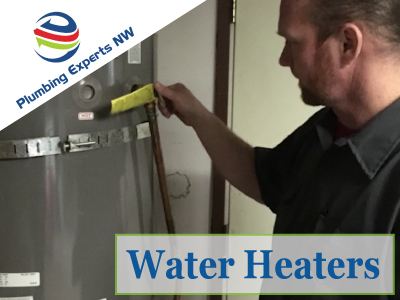 Allow our staff to take your call and get to your emergency water heater repair fast, as you can call on us 24 hours a day at 425-948-7705. You can trust our plumbing technicians to accurately diagnose your water heater and prepare options for you and your home. Whether it's a gas water heater, electric water heater, or a tankless water heater, we will provide you with expert service. In many cases, a water heater reaches it's maximum life and rusts before you know it (approximately 8-10 years of life span). If it turns out that you need a new water heater, you'll be comfortable knowing that we can handle that as well, and give you options like tankless water heater technology and a variety of hot water tank sizes, in case your application needs something different. Getting a new water heater installed correctly is quite vital and important, especially if you want your next water heater to last as long a possible. Plumbing Experts NW is locally owned and family operated, so we deliver expertise with a little more personable touch. Water Heater leaks are annoying for sure, but you can get a trusted advisor and experienced workmanship on your side, in the case that disaster strikes. If there's any sign of water on the ground around your water heater, don't hesitate, just call us. We're here for you, and we want to be your plumbing and water heater repair company in Marysville and surrounding areas. You can depend on us! Call 425-948-7705.